A family owned, boutique producer of Pinot Noir and Chardonnay from the Willamette Valley crafted by winemaker Alex Fullerton. 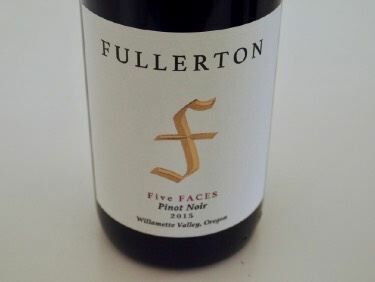 The core lines of wines are named Five FACES, an acronym for the family of oenophiles behind the wines: Filip, Alex, Caroline, Eric and Susanne, all members of the Fullerton family. Happenstance led to Alex becoming a winemaker. He was tasting at Penner-Ash when he found out a harvest intern had dropped out and Lynn Penner-Ash was looking for a replacement. Alex became an intern and later a cellar hand at Penner-Ash. He then worked at Drylands Winery in Marlborough before returning to Oregon and working a harvest again at Penner-Ash and then Bergstrom Winery. Fullerton Wines started in a garage in 2011. Alex and his father Eric partnered with a good friend Roger Wallberg to make a few barrels of Pinot Noir. The wine was a success and Fullerton Wines was hatched at SE Wine Collective in 2012. Production increased to 5,000 cases by 2014. The wines are now vinified at Belle Vallee Cellars in Corvallis. Current production includes a value-priced label, Three Otters, Five Faces Pinot Noir, and vineyard-designated Pinot Noirs. The wines are sold through distribution, the tasting room, a mailing list and the website store.